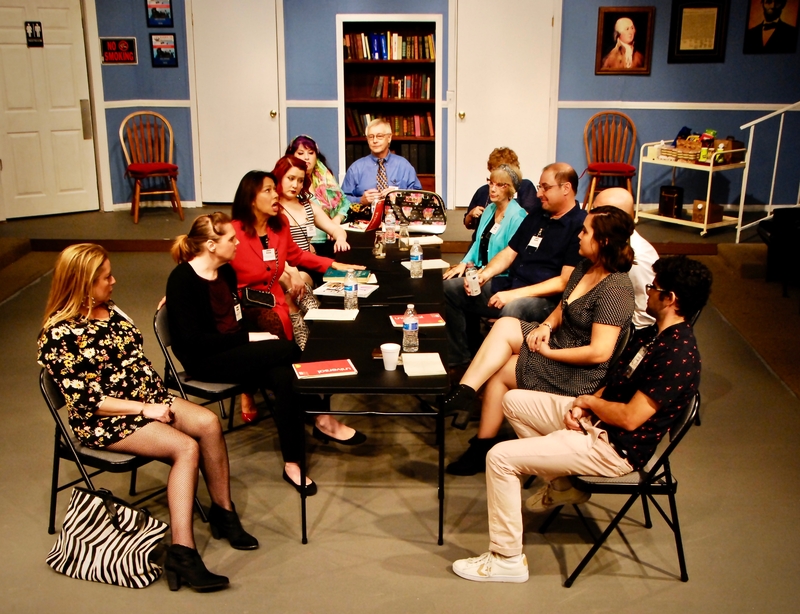 “JURY ROOM” at the Westminster Community Playhouse through Dec. 18 (WCP photo). “Too many words!” stammers the flustered and flighty redheaded juror (Noelle LeBlanc), struggling to explain her confusion at the prosecution and defense’s arguments. In the Westminster Community Playhouse’s production of “The Jury Room,” It’s the aftermath of murder: and twelve strangers have been gathered together to assess the guilt — or innocence — of the accused. Did Julie Fletcher in fact murder her rich Uncle Adrian, or was it a mysterious and unknown intruder, as she herself testified? A student of human nature, the young woman has learned how to analyze people and their motivations (in order to improve her characters), and she remains unconvinced of the accused woman’s guilt — to the frustration of her fellow jurors. While they remain nameless, all have their own distinct characteristics and personalities: besides the actress, the redhead and the angry woman, there’s the jury foreman (Michael Corcoran), a corporate board member; the pair of elderly female jurors (Kip Hogan and Laurie Robbins), concretely convinced of the young lady’s guilt; the brunette astrology devotee (Karla Abrams Franklin); the shy, bashful young woman (Julie Ray);the beautiful and haughty socialite (Kati Moore); the mild-mannered waiter (J.D. Rinde); the wise-cracking man with the glasses (Eric Schiffer); and the quiet and reserved young man (Avi Micah Brown). Though still convinced of the guilt of the accused the young man sides with the actress — in that every angle of the case must be analyzed, in the interest of fairness and justice. But as the redheaded juror has pointed out, the conflicting narratives of prosecution and defense are confusing: how can they best suss out the truth from the fiction? Perhaps, the young thespian suggests, the play’s the thing: if they were to act out the testimony, maybe that could clear up some of the quandaries? While one might expect this Jim Katapodis- directed production at the Westminister Community Playhouse to be a heavy drama, that’s not the case: there are numerous light-hearted moments throughout the show, as the very different personalities interact and clash over their personal beliefs and the burden of proof. There’s also an evolution of character, or perhaps a revealing — as the audience learns more about each of the individuals and who they really are, though they all still remain nameless — for the most part. One fascinating aspect of the play is how the various players reflect the differing strata of society — as well as being mirrored in the roles they themselves portray in the recreation of events leading up to the crime, as they try to understand the truth of what has transpired. Finally, it’s difficult to single out any one particularly striking performance in such a smoothly-running ensemble piece, though Couch, O’Connor and Brown all have intriguing character development through the course of the production, and all the performers certainly have their dramatic and comedic moments in the spotlight. It’s the closing weekend for “The Jury Room” at the Westminister Community Playhouse, but more than worth the effort to catch this engrossing crime dramedy. “The Jury Room”, Maria O’Connor, Robyn Couch and Avi Micah Brown star in this meta whodunit as jurors struggle with the facts — and themselves — to discover the truth behind the murder. 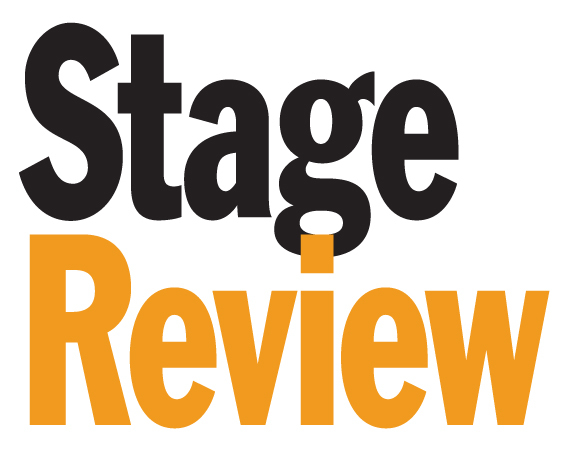 Playing through Sunday, Nov. 18 at the Westminister Community Playhouse, 7272 Maple St, Westminster, CA 92683: ticketing information available online at http://www.wctstage.org, or call 714-893-8626.